The rain persists so, instead of going west down the coastline, we head for Auckland Museum. But we get sidetracked. 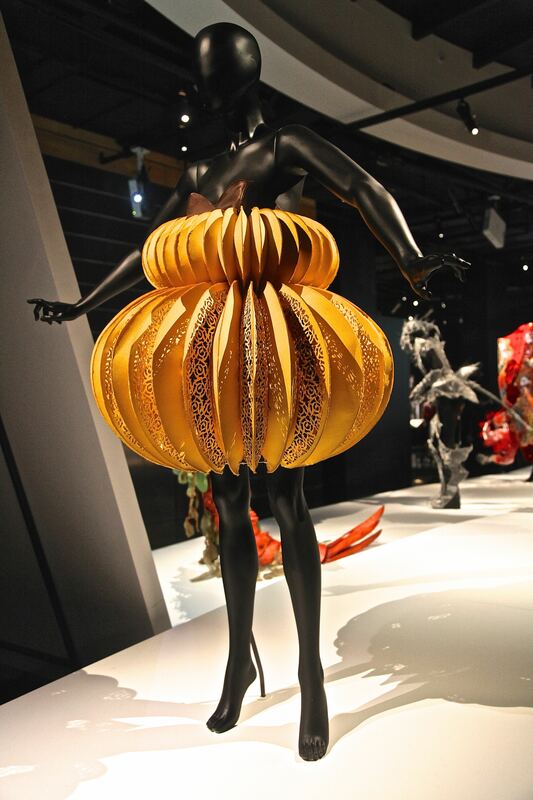 There is a touring exhibition from the Museum of Wearable Art. My friend, Ruth, in London, had insisted I visit this Museum in Nelson. “But it’s not on my schedule,” I insisted. That was irrelevant. I had to go to Nelson. I wasn’t convinced, imagining wearable fashion that I could buy on the high street and bung in the washing machine. I couldn’t have been more mistaken. We enter a dark, cavernous space. 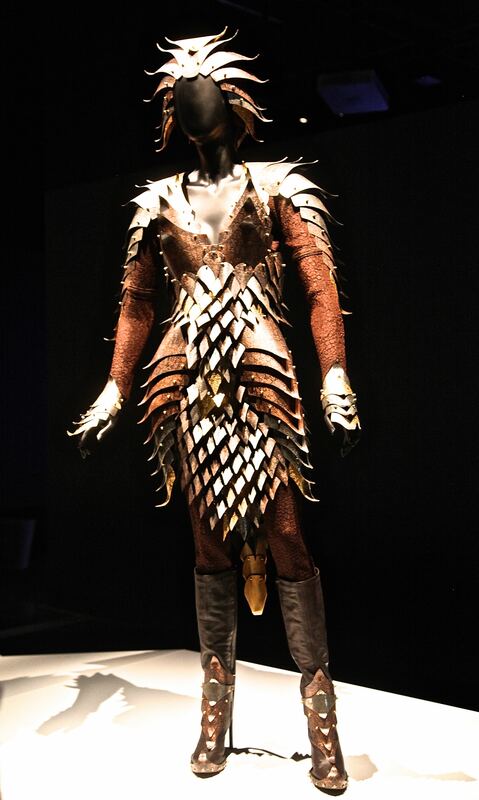 Spotlights light up slender mannequins dressed in intriguing shapes sculpted out of extraordinary materials – lace and leather, crustaceans and chrome, felt and fibreglass. The mannequins stand poised along raised catwalks that criss-cross the room. A woman who, ‘shall go to the ball,’ wears a 17th crinoline made from cedar and mahogany..
a tattoed Samoan and a shapely Moroccan lantern. A leather horse, stitched together with all the skill of a master saddler, holds a spear in its right hoof. “My favourite is the lobster with the magnificent tail,” I tell Tess. We sit down to watch the screening of the fashion show. Greek goddesses carrying coffins. Bouquets of skulls. A clown or two. A dance, music, fashion, high tech extravaganza to outdo any Olympic opening ceremony. ‘We want to take the viewer into a magical world of dreams, a place where they can forget reality and lose themselves in a journey of the imagination,’ writes the producer. As we leave I take a last look at the winner, The Exchange, ‘a contemporary living picture of New Zealand’s Treaty of Waitangi.’ The Māori and European powers, clothed in cape and cloak, exchange feathers and coins. One holds a royal orb, the other a Māori patu or club, linked together by a fragile chain. We move to the Māori gallery. The carving on the marae meeting houses is magnificent. The canoes, in which the Māori sailed to these shores, stretch almost the length of the gallery. The Māori came, as the first inhabitants of New Zealand, a mere 6oo years ago, far more recently than the indigenous people of Australia. The gallery is traditional but impressive. I can’t wait to get to Te Papa. At Tess’s suggestion I buy a ticket for the half hour Maori performance whilst she visits the shop for some last minute Christmas shopping. Young women demonstrate the poi, a sort of dance with balls of flax and bulrush. The dancers lift and twirl two, three, four poi, outwards, upwards and over the shoulder. In the haka dance men beat their breasts, stomp, shout, glare and pull out their tongues. No wonder the All Blacks use the haka to intimidate their opponents. “And the haka? My son can do that,” she adds proudly. I get up early to take the 12 hour train journey to Wellington, 681 kilometres away. As we travel through the landscape I realise why there is only a train every other day. There is only one track. But it’s a splendid track that leads us through lush farmland where sheep scatter as we hurtle past them. Much of the bush landscape was cleared and transformed by the European settlers when they first arrived. We coil round a mountain, climbing the famous Ruarumi spiral, until we arrive at the volcanic plateau. 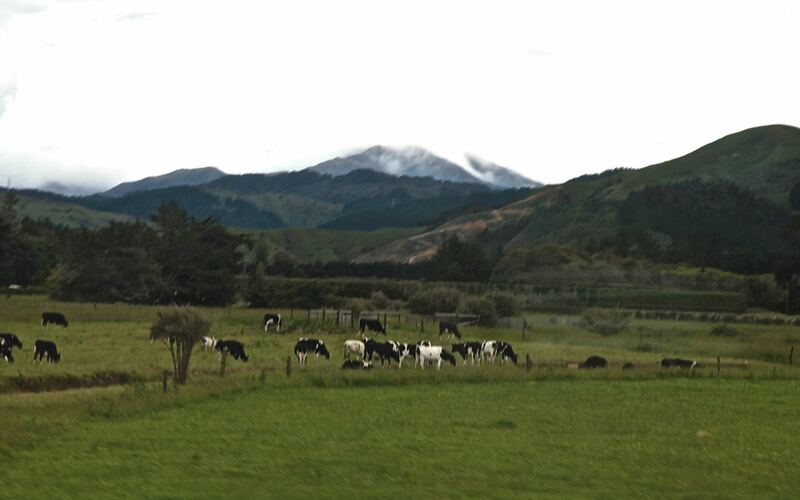 In the distance we can see Mount Ruapehu, Mount Ngauruhoe and Mount Tangariro, all active volcanoes. partly obscured by fluffy tufts of Merino wool. We pass through 14 tunnels and over 353 bridges, one of them over the dramatic cliffs bordering the Rangitikei river. At times I venture out onto the viewing station, camera in hand, but sometimes I just sit back and admire the view. Night envelops us as we approach Wellington, the capital of New Zealand. Terry and Suzanne, my airbnb hosts, welcome me with a glass of wine to their home in historic Thorndon. 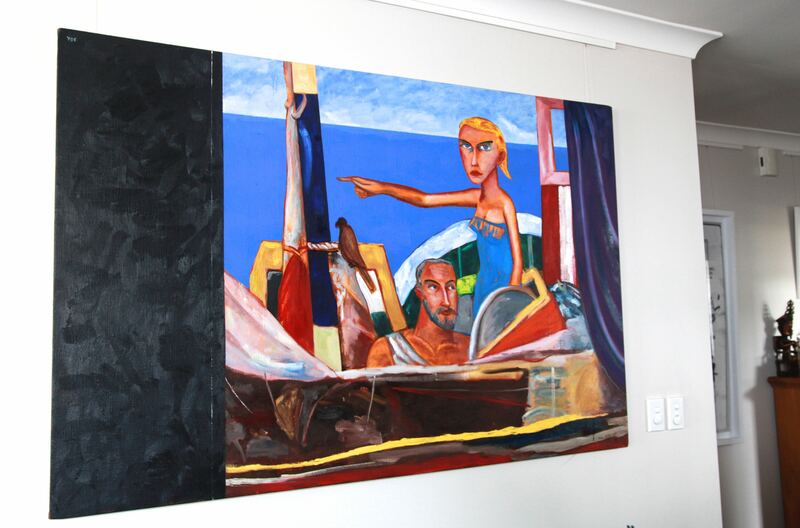 On the wall hangs The Goddess of War and Goddess on Love on a Mediterranean yacht, just one of the original works on their walls. This promises to be an interesting city.